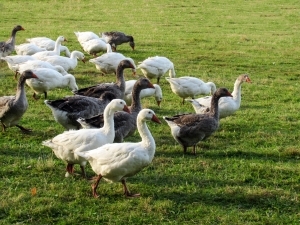 While my wife was out running some errands today, a guy phoned our house about the geese we have for sale. I told him we didn't have any geese for sale. He told me the number he had dialed. I told him that was our phone number but that we did not have any geese for sale. He said there were three ads online with geese for sale - each with our phone number on them. I said, "Really!" as my mind wondered how that could happen because I was positive we didn't have any geese for sale. Then he mentioned something about his sone being in karate. That's when I remembered Susan is trying to sell our son's old karate outfits which, of course, are "gis" - the plural of "gi" (pronounced with a hard "g" and an "ee"). When she arrived home I checked to make sure we aren't selling an afghans - just in case.